Fight to save the Kingdom of Liones. The Seven Deadly Sins: Knights of Britannia is coming exclusively to PlayStation 4 in the Americas (Update: and Europe) in early 2018, Bandai Namco announced at Anime Expo 2017. 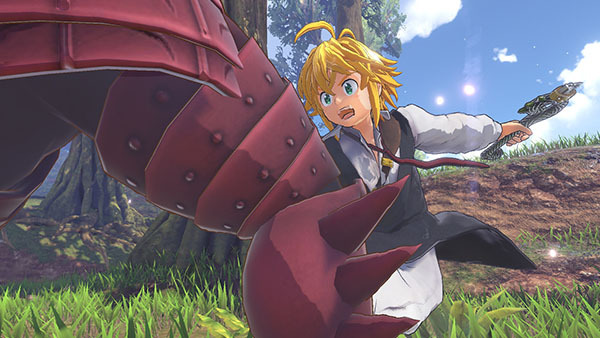 Based on the popular manga and anime series The Seven Deadly Sins, The Seven Deadly Sins: Knights of Britannia is the first console video game adaptation of the franchise that brings together its characters for an “action-packed adventure.” The game follows a gang of rebels blamed for overthrowing the Kingdom of Liones and hunted by elite guards called Holy Knights. When a young girl with “an earnest wish” and a determination to find The Seven Deadly Sins appears, the world gets “turned on its head” and an “extraordinary adventure” begins. Assemble the Seven Deadly Sins and fight to save the Kingdom of Liones in The Seven Deadly Sins: Knights of Britannia, coming to PlayStation 4! Based on the hit manga, The Seven Deadly Sins by Nabaka Suzuki, enjoy stories of adventure and experience all of the action and excitement from the anime. Play through memorable fights with famous characters such as Meliodas, Elizabeth, Hawk, and others in all of their unique fighting styles. Assemble the Seven Deadly Sins – The popular hit anime The Seven Deadly Sins comes to console for the very first time. Lush Environments – The world of Britannia comes to life in a scenic 3D environment, made possible by the power of the PlayStation 4.